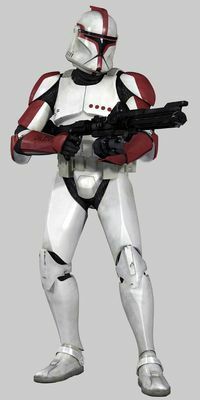 Clone trooper armor is marked with clor-coded flashes. At the beginning of the Clone Wars, the colors signify rank (red for captains, blue for lieutenants, green for sergeants). By the end of the war, the flashes come to identify specialized units such as the Galactic Marines and Shock Troopers. Contribute Profile Information for Clone Trooper Captain.